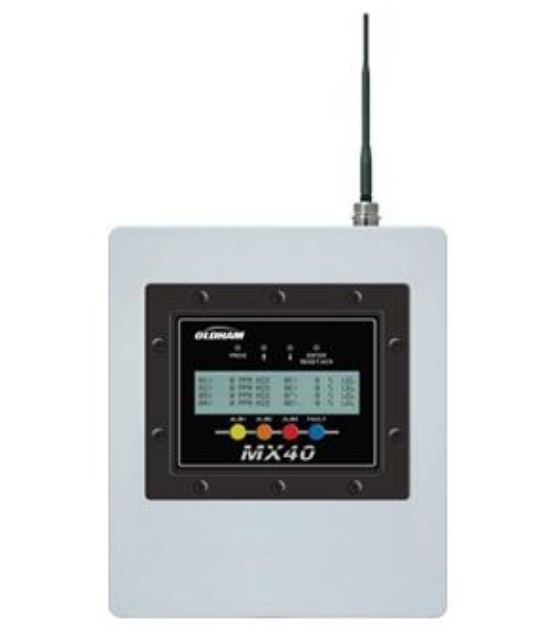 The Oldham MX 40 is a gas detection unit that communicates via radio to the BM 25 wireless units. A unit equipped with LEL, NH3 and O2 cells will occupy 3 measurement channels. Therefore, a maximum of 10 units of this type could be connected to the same MX 40. The technology used is a mesh network. With this type of network, all of the hosts are interconnected, forming a net-like structure. Each network node can receive, send, and relay data. This avoids the problem of sensitive points in the network, which, in the case of an outage, would cut the connection to a part of the network. If a node is out of service, the neighboring nodes will relay the messages via another route. The maximum range between network nodes is 1000 meters, open-field. Because the same message can be relayed 4 times, the maximum distance between a node and an MX 40 unit can reach up to 5000 meters. The frequency is 2.4 GHz. This frequency is the most popular because it is license-free in most places in the world, unlike the 868 MHz and 900 MHz bandwidths. To be precise, communication is carried out on the ISM (Industrial, Scientific and Medical) radio band which is located between 2.4 and 2.4835 GHz. The radio communication is secure and conforms to IEEE standard 802.15.4, issued in June 2005. This standard uses DSSS (Direct-Sequence Spread Spectrum) signaling, which outlines strict rules for transmission and coding. In this signaling process, each bit to be transmitted is transformed into a set of n bits. The main advantage is the assurance of redundancy in the transmission of information, so that transmission errors are controlled and corrected. DSSS has been used by the military since the 1940s. Up to a maximum of 32 measurement points, the MX 40 can combine with BM25 wireless units, 4-20 mA analog detectors, RS485 700-series digital detectors, and other wireless systems from our sister company DETCON. The I/O modules communicate over the MX 40's RS485 network. They are mounted on the DIN rail on the MX 40 enclosure or they may be located remotely, up to 1000 meters from the controller.